The Muslim population in the United States is younger than the U.S. population at large. 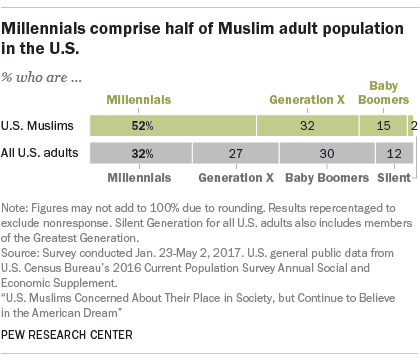 In fact, while Millennials make up 32% of all U.S. adults, they account for roughly half of American Muslim adults (52%). Muslim Millennials were born from 1981 to 1999 and generally came of age after 9/11. Most have transitioned to adulthood, and attended or graduated college. Some have embarked on careers or begun raising families. 1While U.S. Muslims overall are largely an immigrant population (58%), Muslim Millennials are somewhat less likely to have been born abroad than are older Muslim adults (52% versus 64%), according to a 2017 Pew Research Center survey. (Within the general public, 15% of all Millennials are immigrants.) Racially and ethnically, 40% of Muslim Millennials identify as white (including Arabs and people of Middle Eastern ancestry), 29% as Asian (including people of Pakistani or Indian descent), 17% as black and 11% as Hispanic. Muslim Millennials are less likely to be married than are older Muslim adults (36% versus 71%), though they are roughly as likely to be married as Millennials in the general public (30%). 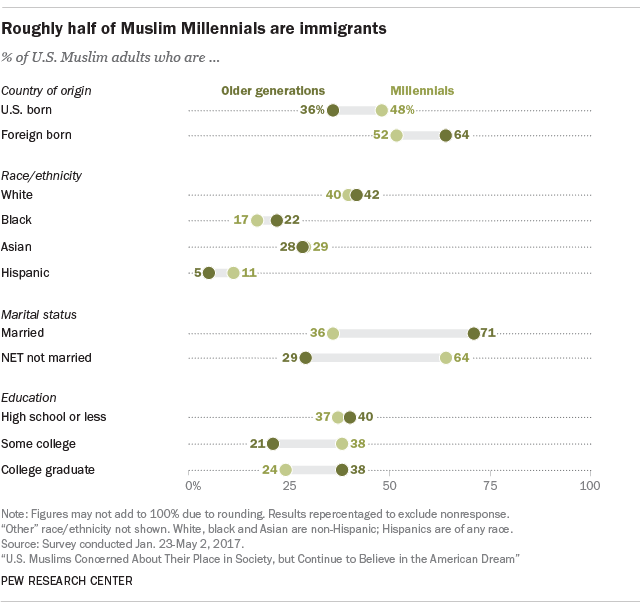 And although Muslim Millennials are less likely than older Muslim adults to have at least a bachelor’s degree (24% versus 38%), they are about as likely to have one as Millennials in the general public (27%). 2 Muslim Millennials are as likely as older Muslim adults to say religion is “very important” in their lives and that they attend religious services at least weekly. This differs from the generational dynamic in some larger U.S. religious groups. Among Catholics, mainline Protestants and members of the historically black Protestant tradition, for example, Millennials are significantly less likely than their respective elders to say religion is very important to them, or that they attend religious services weekly. Millennial evangelical Protestants, on the other hand, are similar to Muslim Millennials in that they are about as likely as older evangelical Protestants to attend weekly worship services and almost as likely to say religion is very important in their lives. 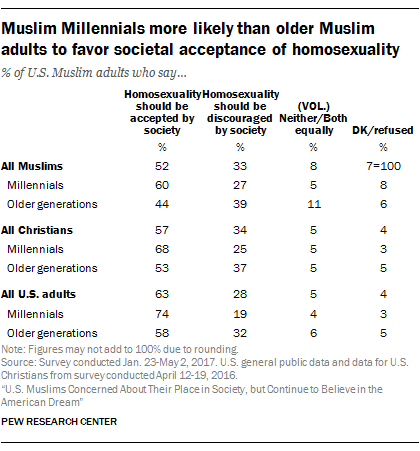 3 Muslim Millennials are more likely than older American Muslims to say homosexuality should be accepted by society (60% versus 44%). And just three-in-ten Muslim Millennials (27%) say homosexuality should be discouraged by society, compared with 39% of older Muslims. The greater acceptance of homosexuality among Muslim Millennials echoes a similar pattern in the general public. Among U.S. Christians – and among the U.S. public as a whole – Millennials tend to be more accepting of homosexuality than are older adults. Among all Muslim adults, sentiment on homosexuality has moved toward greater societal acceptance over the last decade, according to multiple Pew Research Center surveys. This aligns with sentiment among U.S. Christians and Americans as a whole, who have similarly become more accepting of homosexuality over time. 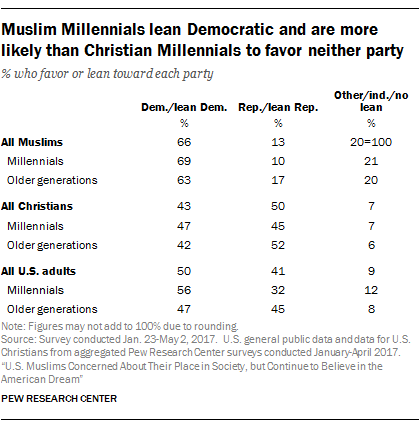 4 Muslim Millennials, like older Muslims, lean heavily Democratic (69%) – more so than Christian Millennials (47%) and the U.S. Millennial population as a whole (56%). This is not to say that Muslim Millennials uniformly embrace the Democratic Party. Only 36%, in fact, say the party is friendly toward Muslim Americans. And Muslim Millennials are more likely (21%) than Christian Millennials (7%) to express a preference for neither major U.S. political party. 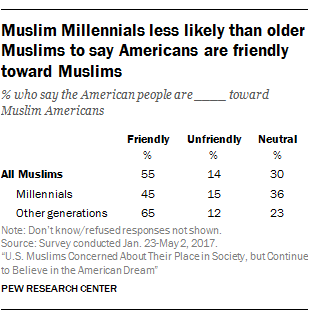 5 Muslim Millennials are less likely than older Muslim adults to say the American people are “generally friendly” toward Muslims in the U.S. (45% versus 65%). This does not mean that most Muslim Millennials find the American people unfriendly toward U.S. Muslims, however. Only 15% of Muslim Millennials say that Americans as a whole are unfriendly toward Muslims, while the remaining 36% of respondents say the American people are neutral toward Muslims.